Atrazine is a common pesticide, which is commonly used on corn crops among others around the world. It has been revealed that this chemical is having a devastating affect on the world’s frog population, turning male frogs into females! Sounds bizarre? It gets worse. Once the male frogs have been turned into females, they can breed successfully with other males. The problem is, because the converted frogs are genetically male and they are breeding with another male, all their offspring will be male! The true male frogs will have no idea, so they will think they have successfully mated, when in fact they have contributed towards their species demise! If you use pesticides, please check the brand on-line to make sure it has no devastating affects on our wildlife! Look at the "W" listings above. Recognise the name Weedex? You should do as it is a very common brand in the UK! I am sure that by now you are all aware that it wouldn't take long for the frogs to breed the true females out and then when the males die, the species will die with them! 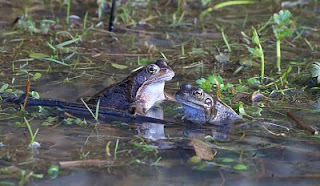 This sight may one day be lost forever from our ponds if we don't act now! PS: This is not scaremongering, it is fact! Interesting stuff, I've not heard of this, thanks for sharing. No prob Lewis, there is a lot of bad stuff going on in this world, but most of it goes unheard of, because it is kept quiet. Tony. That is very extreme indead! However, in your second post you say give the males more Weedex to produce more females? Weedex is a chemical, which changes the biological structure of a male frog so that it turns into a female, BUT it is still genetically a male, this means there is no female gene, so ALL offspring will be male! Its my Birthday today and I've had a few ales, still need a few more to catch up with you I think! I have a vague recollection that Atrazine is banned in parts of Europe, and its use is restricted here? This is a really important topic, so I did a quick literature search, which makes it look as if the effect is not so clear cut [url]http://www.ncbi.nlm.nih.gov/pubmed/19008211[/url]. The original 2002 paper has been challenged (mainly because the treatment levels were hugely above anything found in the field), so it will be interesting to see how this will turn out. My only worry is that in conservation we tend to look for easy solutions, while ignoring the simple fact that we're destroying habitat without a second thought. If it is atrazine causing these deformities, then action is needed, but we shouldn't ignore other potential factors along the way. You are right Mark. We have to look at all the reasons why atrazine was and is being used, then we need to come up with an alternative, which will tackle the potential problems why atrazine is being used in the first place, without it affecting the wildlife around the world. Sounds easy, but like you said, the easy option usually comes first! I think I've now found the recent paper (see what you started!) that this is based on, which seems to refute the refutions (if you see what I mean). The abstract is at http://www.pnas.org/content/107/10/4612. Nasty stuff, and thanks for sharing. Yes very nasty, thanks for the link. Below is another link to an email I received on 12th March from Wildlife Extra. Rates of biodegradation are affected by atrazine's low solubility, thus surfactants increase the degradation rate. Atrazine itself is a poor energy source due to the highly oxidized carbons in the ring. It is catabolized as a carbon and nitrogen source in reducing environments. Atrazine is a widely used herbicide utilized by farmers to control and prevent weeds from growing among crops, especially corn. Public safety measures have increased through the years because of the health risks associated with Atrazine use. Its detrimental effects on ecosystems have also alerted environmental care groups. With proper handling and application, however, Atrazine can provide benefits for agro-industries in a safe, efficient manner. Since the 1950s, Atrazine has been favored in the fight against weeds that prevent abundant yields, or harvests. It also doesn't cause injury to crops and is adaptable to most soil systems. More than 65 percent of America's corn crops are treated with Atrazine. Herbicide workers also spray the chemical over highways and railroad paths.